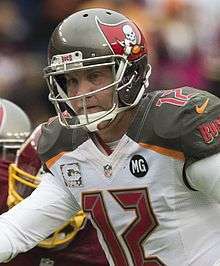 These quarterbacks have started for the National Football League's Tampa Bay Buccaneers. They are listed in order of the date of each player's first start at quarterback for the Buccaneers. Here is a list of Buccaneers starting quarterbacks during the postseason and the number of games they started. These quarterbacks have the most starts for the Buccaneers in regular season games. ↑ "2014 Tampa Bay Buccaneers Statistics & Players". Pro Football Reference. Sports Reference LLC. Retrieved 2015-01-01. ↑ "2011 Tampa Bay Buccaneers Statistics & Players". Pro Football Reference. Sports Reference LLC. Retrieved 2011-09-11. ↑ "2010 Tampa Bay Buccaneers Statistics & Players". Pro Football Reference. Sports Reference LLC. Retrieved 2010-12-20. ↑ "2009 Tampa Bay Buccaneers Statistics & Players". Pro Football Reference. Sports Reference LLC. Retrieved 2010-12-20. ↑ "2008 Tampa Bay Buccaneers Statistics & Players". Pro Football Reference. Sports Reference LLC. Retrieved 2010-12-20. ↑ "2007 Tampa Bay Buccaneers Statistics & Players". Pro Football Reference. Sports Reference LLC. Retrieved 2010-12-20. ↑ "2006 Tampa Bay Buccaneers Statistics & Players". Pro Football Reference. Sports Reference LLC. Retrieved 2010-12-20. 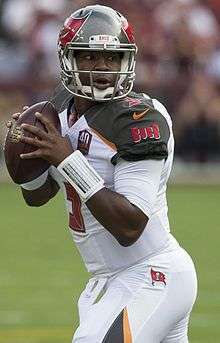 ↑ "2005 Tampa Bay Buccaneers Starters, Roster, & Players". Pro Football Reference. Sports Reference LLC. Retrieved 2010-12-20. ↑ "2004 Tampa Bay Buccaneers Starters, Roster, & Players". Pro Football Reference. Sports Reference LLC. Retrieved 2010-12-20. ↑ "2003 Tampa Bay Buccaneers Starters, Roster, & Players". Pro Football Reference. Sports Reference LLC. Retrieved 2010-12-20. ↑ "2002 Tampa Bay Buccaneers Starters, Roster, & Players". Pro Football Reference. Sports Reference LLC. Retrieved 2010-12-20. ↑ "2001 Tampa Bay Buccaneers Starters, Roster, & Players". Pro Football Reference. Sports Reference LLC. Retrieved 2010-12-20. ↑ "2000 Tampa Bay Buccaneers Statistics & Players". Pro Football Reference. Sports Reference LLC. Retrieved 2010-12-20. 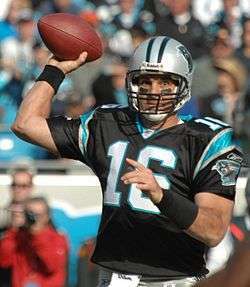 ↑ "1999 Tampa Bay Buccaneers Starters, Roster, & Players". Pro Football Reference. Sports Reference LLC. Retrieved 2010-12-20. ↑ "1998 Tampa Bay Buccaneers Statistics & Players". Pro Football Reference. Sports Reference LLC. Retrieved 2010-12-20. ↑ "1997 Tampa Bay Buccaneers Statistics & Players". Pro Football Reference. Sports Reference LLC. Retrieved 2010-12-20. ↑ "1996 Tampa Bay Buccaneers Statistics & Players". Pro Football Reference. Sports Reference LLC. Retrieved 2010-12-20. ↑ "1995 Tampa Bay Buccaneers Statistics & Players". Pro Football Reference. Sports Reference LLC. Retrieved 2010-12-20. ↑ "1994 Tampa Bay Buccaneers Statistics & Players". Pro Football Reference. Sports Reference LLC. Retrieved 2010-12-20. ↑ "1993 Tampa Bay Buccaneers Statistics & Players". Pro Football Reference. Sports Reference LLC. Retrieved 2010-12-20. ↑ "1992 Tampa Bay Buccaneers Statistics & Players". Pro Football Reference. Sports Reference LLC. Retrieved 2010-12-20. ↑ "1991 Tampa Bay Buccaneers Statistics & Players". Pro Football Reference. Sports Reference LLC. Retrieved 2010-12-20. ↑ "1990 Tampa Bay Buccaneers Statistics & Players". Pro Football Reference. Sports Reference LLC. Retrieved 2010-12-20. ↑ "1989 Tampa Bay Buccaneers Statistics & Players". Pro Football Reference. Sports Reference LLC. Retrieved 2010-12-20. ↑ "1988 Tampa Bay Buccaneers Statistics & Players". Pro Football Reference. Sports Reference LLC. Retrieved 2010-12-20. ↑ "1987 Tampa Bay Buccaneers Statistics & Players". Pro Football Reference. Sports Reference LLC. Retrieved 2010-12-20. ↑ "1986 Tampa Bay Buccaneers Statistics & Players". Pro Football Reference. Sports Reference LLC. Retrieved 2010-12-20. ↑ "1985 Tampa Bay Buccaneers Statistics & Players". Pro Football Reference. Sports Reference LLC. Retrieved 2010-12-20. ↑ "1984 Tampa Bay Buccaneers Statistics & Players". Pro Football Reference. Sports Reference LLC. Retrieved 2010-12-20. ↑ "1983 Tampa Bay Buccaneers Statistics & Players". Pro Football Reference. Sports Reference LLC. Retrieved 2010-12-20. ↑ "1982 Tampa Bay Buccaneers Statistics & Players". Pro Football Reference. Sports Reference LLC. Retrieved 2010-12-20. ↑ "1981 Tampa Bay Buccaneers Statistics & Players". Pro Football Reference. Sports Reference LLC. Retrieved 2010-12-20. ↑ "1980 Tampa Bay Buccaneers Statistics & Players". Pro Football Reference. Sports Reference LLC. Retrieved 2010-12-20. ↑ "1979 Tampa Bay Buccaneers Statistics & Players". Pro Football Reference. Sports Reference LLC. Retrieved 2010-12-20. ↑ "1978 Tampa Bay Buccaneers Statistics & Players". Pro Football Reference. Sports Reference LLC. Retrieved 2010-12-20. ↑ "1977 Tampa Bay Buccaneers Statistics & Players". Pro Football Reference. Sports Reference LLC. Retrieved 2010-12-20. ↑ "1976 Tampa Bay Buccaneers Statistics & Players". Pro Football Reference. Sports Reference LLC. Retrieved 2010-12-20. ↑ "Tampa Bay Buccaneers at Dallas Cowboys - January 9th, 1983". Pro Football Reference. Sports Reference LLC. Retrieved 2010-12-20. ↑ "Detroit Lions at Tampa Bay Buccaneers - December 28th, 1997". Pro Football Reference. Sports Reference LLC. Retrieved 2010-12-20. ↑ "Tampa Bay Buccaneers at Green Bay Packers - January 4th, 1998". Pro Football Reference. Sports Reference LLC. Retrieved 2010-12-20. ↑ "Tampa Bay Buccaneers at Philadelphia Eagles - December 31st, 2000". Pro Football Reference. Sports Reference LLC. Retrieved 2010-12-20. ↑ "San Francisco 49ers at Tampa Bay Buccaneers - January 12th, 2003". Pro Football Reference. Sports Reference LLC. Retrieved 2010-12-20. ↑ "Tampa Bay Buccaneers at Philadelphia Eagles - January 19th, 2003". Pro Football Reference. Sports Reference LLC. Retrieved 2010-12-20. ↑ "Tampa Bay Buccaneers vs. Oakland Raiders - January 26th, 2003". Pro Football Reference. Sports Reference LLC. Retrieved 2010-12-20. ↑ "Washington Redskins at Tampa Bay Buccaneers - January 7th, 2006". Pro Football Reference. Sports Reference LLC. Retrieved 2010-12-20. 1 2 "New York Giants at Tampa Bay Buccaneers - January 6th, 2008". Pro Football Reference. Sports Reference LLC. Retrieved 2010-12-20.